A Busy Mom's Slow Cooker Adventures: Spaghetti Squash - Doesn't Get Easier Than This! 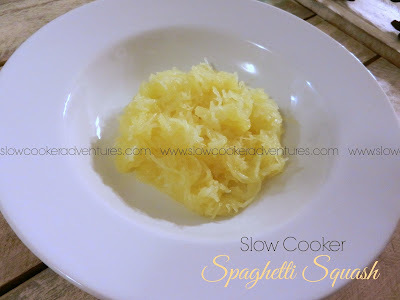 Spaghetti Squash - Doesn't Get Easier Than This! I can't wait to share this with you. The easiest thing EVER and super Healthy too! Spaghetti Squash is so good for you and such a great alternative to traditional spaghetti noodles. If you've been scared to try this vegetable in the past, fear not! It's VERY easy to prepare and tastes delicious! Cut you squash in half. Scoop out the seeds and guts. Place both halves in your slow cooker. Cook on LOW for 6 hours, or on HIGH for 3-4 hours. With a fork, scoop out your spaghetti squash.